CAN HAYE BRING THE HEAT? It has been almost ten years since there was a heavyweight boxing match for American fans to get excited about. Of course, if you're Polish, you had Golota-Adamek, but for fans in the USA, the last fight to truly generate massive interest was Tyson vs. Lewis, a match that grossed more than $100,000,000 and did almost two million buys on Pay-Per-View. That record wouldn't be broken until the "Golden Boy" fought the "Pretty Boy" in 2007. Neither one of the fighters who will be going into the ring on July 2nd are American, but American fans of heavyweight boxing are hoping to see something they haven't seen for a long time: a competitive Klitschko match. There's no doubt that the good Doctor Steelhammer is finally going to be fighting with passion because, quite frankly, he is pissed. As he said in a pre-fight press conference, David Haye wanted to get under his skin and it worked. For Haye's sake, let's hope it didn't work too well. Klitschko the Younger has endured David "The Hayemaker" Haye harassing him, mocking him with t-shirts, comparing him to "Rocky" foe Ivan Drago, postponing and pulling out of the fight, denying Wladimir the opportunity to get his chance in the ring. Barring a freak training accident, we will finally get to find out what Haye can do as a Heavyweight. He danced with freak of nature Nikolai Valuev and he grappled with the remains of John Ruiz, but now he gets to fight the most dominant Heavyweight of the nascent 21st century. Will he fold? For an English homeboy, it is going to be hell performing in front of 50,000 plus pro-Klitschko fans in Germany. Rocky Balboa had an easier task fighting Drago in the old Soviet Union. Haye will also discover that Klitschko has more than a jab in his arsenal, and that his footwork is more versatile than the lumbering Frankenstein Haye has made him out to be. The great trainer Emanuel Steward once remarked that the hardest part of fighting Klitschko was dealing with the angles of his punches. He throws hybrid half-hooks, half-straights, and semi-jabs that wind into uppercuts. A sometimes shaky chin has always been his Achilles' heel, but you need to be a solid-born heavyweight to capitalize on this weakness, not a cruiserweight making the leap up in weight. If Haye cannot knock Klitschko out, and a hostile arena makes a decision a little harder to knick, what exactly can he do? Try to stay alive, for one thing. Both Klitschko brothers are fiercely loyal to each other, so much so that a title unification is out of the question because they promised their mother they wouldn't fight one another. Wlad is not going to forget Haye parading around with a picture of him gloating over the decapitated head of his beloved brother. 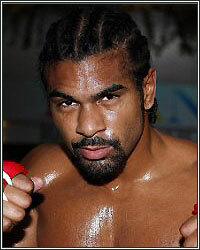 Even if Haye beats the 7 to 5 odds, which are generous to him, he will have to pay hell to reach that glory.